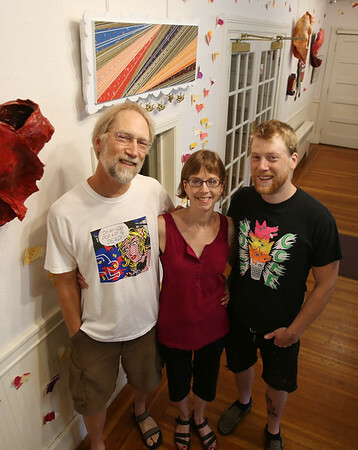 Steve, Kacy, and Noah Pierce, the family of Holly Windrush Pierce, will be displaying an art show called A Hundred Hearts "For Holly," in the Stetson Gallery at the Unitarian Universalist Church, in Marblehead, in honor of Holly, who was tragically killed by a car in Vinnin Square in August 2004. DAVID LE/Staff photo. 9/1/14.